Normally, mature erythrocytes have a rounded, biconcave shape that is flexible enough for the small cells to squeeze through even the smallest of blood vessels. 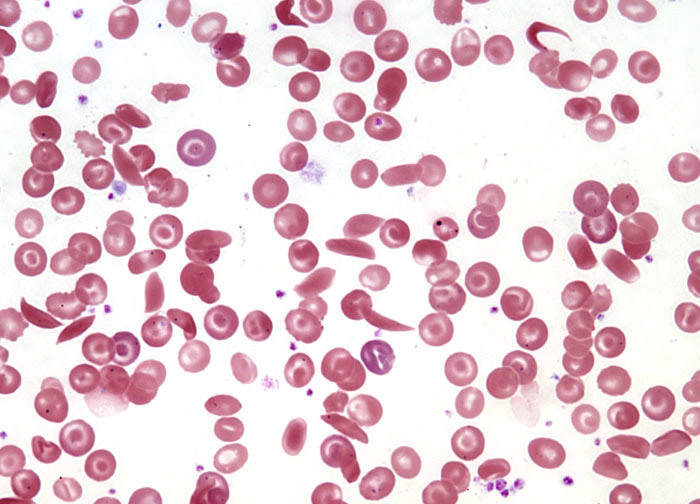 In individuals with sickle cell anemia, however, many red blood cells assume a rigid sickle-like shape that can hinder their passage through diminutive capillaries, resulting in oxygen deficiency to certain tissues as blockages form. Sickled red blood cells are unusually fragile and prone to breakage, so they only survive in the bloodstream for about a tenth of the time that normal erythrocytes remain in circulation, increasing the effects of anemia. Among the most common symptoms of sickle cell anemia are fatigue, breathlessness, joint pain, delayed growth, jaundice, rapid heart rate, increased susceptibility to infections, and sporadic attacks of pain (often termed crises) in the abdomen or other areas of the body. Complications of the genetic disease may include ulcers, damage to the eyes, strokes, and seizures.